your beautiful, healthy and confident smile is our top priority. The transparent aligners make it hard to notice you're even wearing braces. Your smile a is window to the world. At Expressions Dental™ Clinic, you are our focus of attention. Our dentists are enthusiastic to provide you a variety of dental services including emergency dental care, cosmetic procedures such as dental veneers and Invisalign. 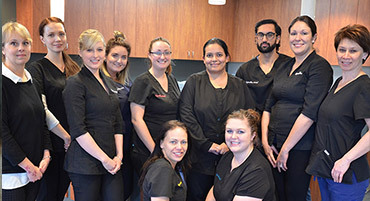 Our dental team looks forward to caring for you and helping you achieve optimal oral health. If you are looking for comprehensive dental care, Expressions Dental™ maybe the answer to your dental health care. We are able to provides services to the public such as Invisalign braces, Zoom teeth whitening, cosmetic procedures, root canal procedures, for children dental care, teeth extractions, implant procedures, sedation and other general dentistry procedures. Emergency patients are always welcome, as health care professionals we take true dental emergencies very seriously. Phone lines and an after hours phone calls and a message system after 10 PM is available for anyone who may feel they have a true dental emergency. Our staff will contact you with information you have provided the next business day, depending on the time you called. Emergency appointments can also be requested online and contacted the next morning if requested after hours. Come see us at Expressions Dental™ for all your dental needs. Expressions Dental™ now serving: Airdrie, Calgary NW/NE. To get dental treatment at Expressions Dental™ clinic, Call us at (403)-252-7733 and book an appointment. Our general dentists team at Expressions Dental™ located in Calgary NW, provides all aspects of general dentistry. Dental hygiene is the practice of keeping our mouths clean, healthy and in stable condition. Our registered dental hygienists which you may be unfamiliar with, perform your regular six month dental cleanings. Dental practitioners at Expressions Dental™ Clinic understand that dental emergency can happen any time, so if it’s not attended on time then it can be really devastating for a patient’s dental health and life. That is why our dental team is available to provide you dental care in extended evening and weekend hours. At Expressions Dental™ you can be assured that as soon as you come in for any emergency dental situation, you are assisted by our dental staff. We try to provide dental treatment on the same day under most circumstances.